Video poker rules are going to differ from one game to the next, but most of the core rules are going to be similar. I’m going to go over the various policies, practices, and routines you’ll go through in a typical session of video poker. I might even discuss video poker etiquette and what goes for correctness in a casino. So get ready for a video poker rules guide. Anyone who’s ever played poker at their house, on vacation, or at family reunions is going to be familiar with many of the basic rules of video poker. That’s because the game is drawn from five-card stud, probably the most popular of all poker games played among friends and family (at least until ESPN introduced the mainstream to Texas Hold’Em). That means you’ll know a lot of the rules I’m talking about. Like in any card game played at the casino, the object of video poker is to build the best hand. You’ll be dealt five cards, be given a chance to discard any combination of those cards (or keep all), and be given replacement cards one time. After the second deal, you’ll have to build a high hand to win money. This is the first significant deviation from 5-card stud. In-home poker games, it’s you versus an opponent and probably multiple opponents. You might try bluffing your opponent out of the hand or try to figure out if they’re doing the same to you (though it’s not too advisable in penny-ante home games–it never works). The point being, classic poker pits your hand against another player’s hand. Not so in video poker. In video poker, you’re only trying to reach certain benchmarks to see whether you win or not. If you get two face cards of the same type or a better hand, you’ll win in Jacks or Better. You won’t win much money unless you start building hands like a three of a kind, a straight, a flush, or a full house. The high hand is a royal flush. Let me put out the ranks of what you’ll find in Jacks or Better video poker. From top to bottom, these are the hands that win money in Jacks or Better video poker. A pair with any of the card ranks between 2 and 10 lose. If you can’t make a pair, you lose. Since that constitutes a majority of possible poker hands, you’ll lose most bets. But if you hit on a few big poker hands, that will more than outweigh what you’ll lose over a limited time. Of course, you might be wondering what some of these hands mean. A full house is 3 of one card rank and 2 of another. If you get a 7-7-7-4-4, that’s a full house. If you get Queen-Queen-Queen-2-2, that’s a full house. 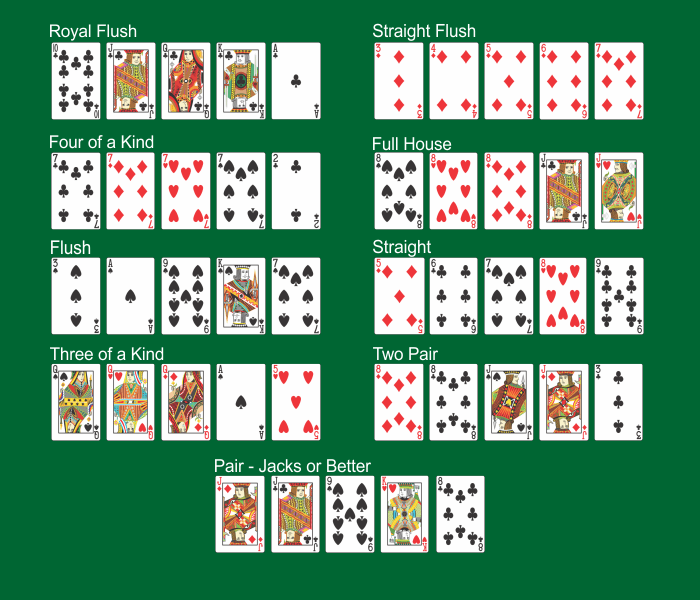 A “straight” is five cards in a number sequence or ranked sequence. The card ranks are 2, 3, 4, 5, 6, 7, 8, 9, 10, Jack, Queen, King, and ace, though an ace can be either a high card of a 1-card so that it can fill out a straight in either direction. So if you get a 4-5-6-7-8, you have a straight. If you get a 9-10-Jack-Queen-King, you also fill out a straight. On a similar note, a “flush” is five cards with the same suit: five Hearts, five Diamonds, five Clubs, or five Spades. A straight flush has to be both a straight and a flush, which is quite rare. The pinnacle of poker hands is the Royal Flush–the rarest of the rare. A Royal Flush has to be a straight (5 in a row), a flush (all of one suit), and contain all the face cards: the Jack, Queen, and King (and Ace). In other words, the stars have to align and you have to have the 10-J-Q-K-A all of one suit. You’ll find only four such combinations in all the many hand combinations possible in a 52-card deck of cards. It doesn’t matter what you have the Royal Flush of hearts, clubs, diamonds, or spaces, but they have to all be perfectly matched. These happen about 1-in-40,000 hands. Let’s talk about video poker form and tradition. Manners apply in a casino, just as they apply in polite society. A casino is a social place, so don’t be rude. That being said, you won’t find many rules of etiquette, for one main reason: video poker is a solitary game. Keep that in mind at all times. If video poker players wanted to talk and make friends while they gambled, they probably would be at the live poker tables or the craps table. Since they are gambling against a machine, you have to assume they prefer their solitude and prefer relaxation and quiet. Don’t be loud on video poker row. You’re ruining the fun of other people. If someone starts talking to you and you don’t mind the conversation, talk as much as you like without disturbing any other gamblers. This might be helpful later. If you’ve picked out a machine and you’re convinced it’s going to pay out or it’s the best machine to play at, you might have a dilemma when it comes time for a restroom break. Do you cash out and leave the machine for someone else to take while you’re away, or do you find someone (perhaps that person you were chatting with) to watch over the machine and shoo people away while you take a break? In the latter case, you might end up losing whatever money you had in the machine because the person can cash the ticket and leave. You have two options. One is to cash out, leave a few dollars in the machine while they watch, then fill up the machine with money when you get back. The other is to flag down a member of the staff and ask them to put an “out of order” sign on the machine until you return. They usually try to accommodate you. This brings me to the main focus of my video poker etiquette session. Treat the casino staff right. Be a good tipper. You’re getting drinks for free, and you’re wagering money left and right, so don’t be sparse with the coins when it comes time to tip the attendant who’s been bringing you free drinks all day. Be nice to them, and they’ll make your video poker experience more pleasant, too.